Martin Scorsese is probably something of a genius. Maybe you already believe that, but given his recent run of films it is something that I think must be very much up in the air. 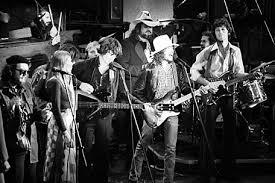 Back in the 1970s, though, his genius-ness was not really in doubt, and The Last Waltz is a very nice piece of proof. March Sara Dylan files for divorce. That’s not much for blogging. So I’m putting The Last Waltz in here even though it’s against the rules. Sue me. Let’s start with the Dylan section, since this is his blog. Dylan came out and did six songs at the end of the show: “Baby Let Me Follow You Down”, “Hazel”, “I Don’t Believe You”, “Forever Young”, “Baby Let Me Follow You Down” (again), and “I Shall Be Released”. It was a logical series of songs to play. “Baby” and “I Don’t Believe You” were staples of the Dylan/Hawks tour in 1966, and are seemingly required to be here. “Hazel”, from Planet Waves, is one of the least played Dylan/Band collaborations. Indeed, Dylan’s own site lists him performing it only seven times ever (in 2004 and 2005), but doesn’t list this version for some reason. “Forever Young” is the sort of thing that you probably have to play at a show like this, and “I Shall Be Released”, as the great big group sing-a-long, has an aura of inevitability. Of these six, only the final three make it into the film. Apparently there were backstage negotiations about whether or not Dylan’s performance was even going to be recorded. He thought it would compete with Renaldo and Clara, and so didn’t want the footage shot. They compromised on half with the agreement that the film would only be released after Renaldo and Clara. Of course, Dylan’s film was a complete bomb, and The Band’s film is hailed as one of the most important concert documentaries ever. Probably because Scorsese is something of a genius. Sticking with Bob just a moment longer, it is a shame that the whole twenty-five minutes couldn’t have been in the film. He and The Band were on fire here. The first version of “Baby” is better than the second, and it bleeds directly into “Hazel” without even allowing a time for the audience to applaud. Dylan strides around the stage full of confidence, and looks like he’s having a great time. This is months after the end of Rolling Thunder, and he is a different performer than he ever had been with The Band before. The universal sense is that he was considerably more comfortable on RTR than on the 1974 tour, and he evinces a lot of that confidence here. The Dylan section is one of the highlights of the whole thing. Even despite the hat. A lot of the rest of the film also has highlights. There’s a great deal to like in this film. Greil Marcus’s review of the concert had not been very positive, but his review of the film was effusive. Listening to the bootlegs, it does seem that a lot of the crap in the five hour plus show was jettisoned, because Scorsese is something of a genius. Among the highest points for me are Joni Mitchell doing “Coyote”, a song that she was writing and re-writing on the Rolling Thunder Revue, so one that I had just read a lot about in Sloman’s tour diary. “The Weight” with the Staples Singers during rehearsals, which seems to be just about one of the most profound pop songs ever in that recording. Neil Young, stoned out of his head (apparently they had to rotoscope a chunk of cocaine out of his nostril – now you can do that digitally) looking like he’s going to fall over and then hitting a perfect “Helpless”. Eric Clapton breaking his guitar strap during a solo and having Robbie Robertson effortlessly step in to continue it (my favourite moment in the whole film). And, of course, Van Morrison singing “Caravan” in that ill-fitting jumpsuit and then karate-kicking his way off stage. I could watch that for years. 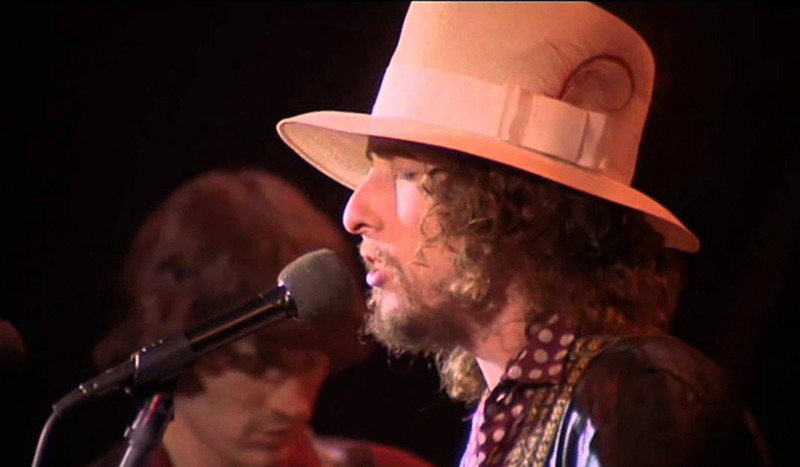 Morrison wrote that song in Woodstock, where Dylan and The Band had lived, and it opens up the mental possibility that he and The Band could have been as productive together as they were with Dylan. Probably the great missed opportunity of the 1970s would have been a Van Morrison/The Band album and world tour. 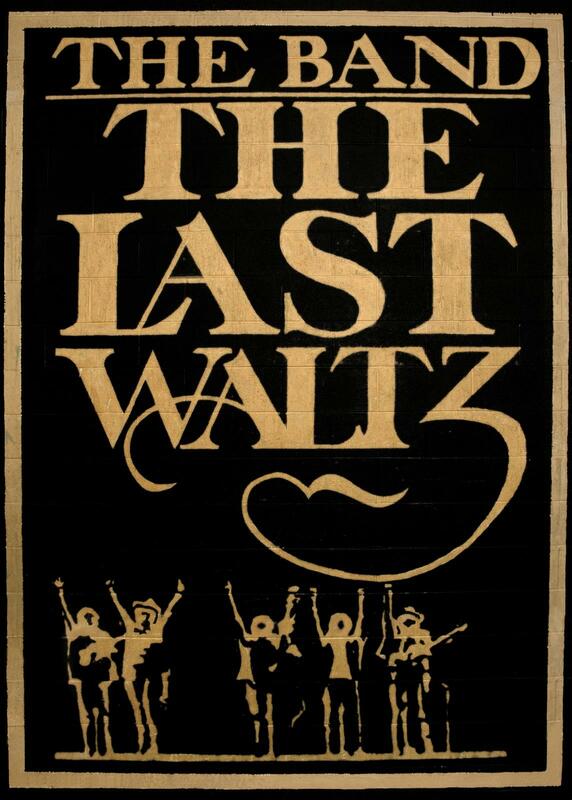 The Last Waltz was a great idea – perform a final show at the venue where you first performed (under the name), intercut with interviews reflecting on sixteen years together. The show itself opened with ballroom dancing at 5:00 and a turkey dinner served to the crowd. A five hour show followed, including the inevitable superstar extended jam session (cut from the film – Robertson announces it, but the film mercifully ends before they get started). Those things are always awful if you’re not playing in them, and it sounds like Scorsese was a genius for getting rid of that footage. Back in the day, when they were The Hawks, Levon Helm used to come to my high school every day to pick up his girlfriend, Cathy Smith. Smith had a relationship with Helm and also with Rick Danko. Sometime a bit later Richard Manuel asked Smith to marry him, and at one point she was pregnant with “The Band Baby” since no one had any idea who might have been the father. After leaving the orbit of The Band she had an extended affair with Gordon Lightfoot. By the mid-1970s she became the drug dealer supplying Ron Wood and Keith Richards. When The Band played SNL in 1976, she met John Belushi. Six years later she would inject him with the speedball that killed him, and would do time for it. Aldershot High, everyone. I studied under the same man who taught John Belushi’s killer. And also Jim Carrey, but that has nothing to do with The Band. Anyway, given that happy story, we watched The Last Waltz in class. I remember being somewhat unimpressed by it. Watching it again this weekend, I could see all of its merits, and how much influence it has on every rock doc that ever followed it. It’s far from perfect, but Scorsese’s cutting from interview segments to ironic or insightful song performances that are shaded by the preceding commentary is very effective. It’s a really strong film of what seemed to be only a pretty good concert. Some sort of genius. The Band planned to continue recording but not touring (like the Beatles a decade before them – Ringo was even there, setting a slow tempo for “I Shall Be Released”) but it didn’t work out that way. Robertson went on to have the greatest personal fame, and he seems to have caught the blame from Helm and others. The Band, without Robertson, resumed touring in 1983. I would say that this is a mark against the film, but then I also recall the night that The Who played their final ever show in Toronto and they toured again endlessly too. It’s rock and roll, who’re you going to believe? Hey! The entire film is available online here! Glad to see Van Morrison getting some love here–a Van/The Band album tour is the the stuff of my dreams. I think in the short run Robbie Robertson was the marquee name, but over time Levon Helm turned out to be the bigger musical figure. I too love that Clapton guitar strap breaking moment and use it in class to talk about passion and professionalism (the good kind). I too vote for Van/The Band tour as a great lost opportunity.